Travis had other plans that night, so our friend Ben stepped in as my dinner date. We had a little scheduling snafu at the hostess desk, but after that we were well taken care of by all the staff and Sara, the general manager. As soon as we were seated, champagne (delicious!) and their signature Seafood Napolean appetizer appeared on the table. The napolean is a stack of avocado, crab, and spicy tuna, topped with caviar and served with toasted baguette slices. Osetra has a new raw bar, which features sushi, scallops, clams, mussels, oysters, and crab, most of which is farmed locally in San Diego. The spicy tuna is their own secret recipe, but none of the flavors mask the freshness of the tuna itself. We also got to try the Spicy Tempura Tuna Roll and Sashimi Tuna (which is really more like seared tuna). The tempura roll was really light and crispy, which I liked since I tend to run into tempura rolls that are too heavily battered and get soggy too quickly. The tuna kind of gets lost in all the sushi rice and tempura, but as a whole, the bite was extremely tasty. The seared tuna was probably the favorite of the appetizers. I don’t know how tuna can be “meaty”, but this tuna was, in a good way! Very tender, very fresh, yet with a good meaty texture and a very nice house made soy sauce reduction. Each plate had a little salad of mixed greens and pineapple salsa, which we probably would have finished if we hadn’t been busy stuffing our mouths with non-salad items. The Valentine’s Day oyster shooters (Cupid Shooters) are oysters with grapefruit juice, grapefruit infused vodka (again, house made), and topped with caviar. We also tried a couple of oysters from Carlsbad Aquafarms with Osetra’s spicy vodka mix on top. Both oysters were delicious – fresh and clean and slippery – but I wasn’t really loving the grapefruit flavors with the oyster. We told Sara the spicy shooters were our favorite, and then she brought them out the way they’re normally served – in a salt-rimmed glass with a wedge of lime. I had to drink some of the liquid first before finishing the shooter, and then we had to let our mouths cool down a bit from all that spice, but it was very tasty. I may be more of an oyster purist, though, as I think I prefer my oysters with just a dash of heat and a squeeze of lemon. 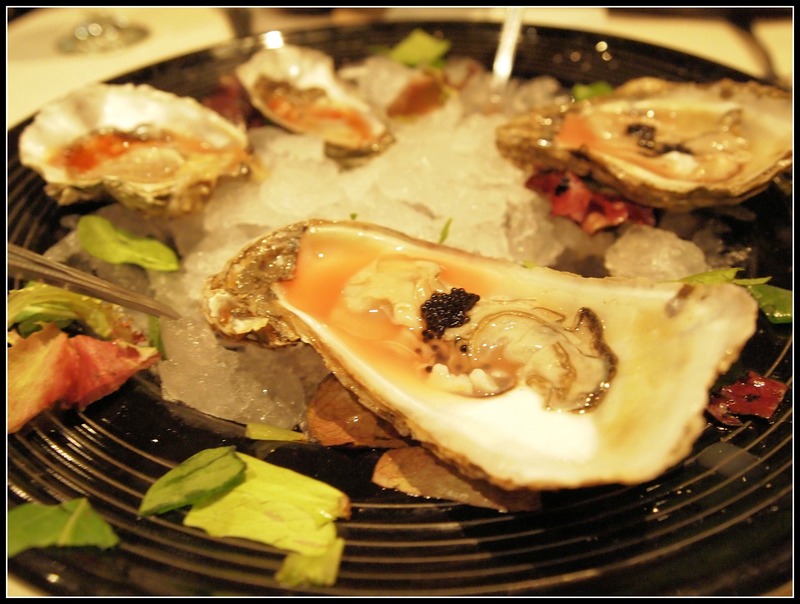 Knowing the quality of the oysters at Osetra, though, I wouldn’t hesitate to get a few on the half shell. When we were perusing the menu earlier, Ben pointed out the mahi mahi with lobster mashed potatoes, so that’s the entree they brought out for us to try. They split it into two portions, which is why the fish might look a little small for an entree. I found the edges of the mahi mahi to be a little dry (perhaps because it was smaller?) but the center was perfectly cooked and moist. The winner on the plate, though, was the lobster mashed potatoes, hands down. Creamy, buttery, with little bits of lobster mixed in – I tried to eat every last morsel but I was just getting too full. But, never too full for dessert! Sara came by to let us know we’d be sampling their chocolate mousse, which will be served in a heart, for those of you looking to dine out on V-Day. They also have a tiramisu, cannoli, and creme brulee. I was trying to decide if we should go for a creme brulee or cannoli, but Sara said we didn’t have to choose! I love not having to choose! Especially if it results in more sweets to try. The chocolate mousse was layered with raspberry mousse, with a small well of raspberry gel in the middle. But, it wasn’t very mousse-y; it was dense and almost a little cakey. Chocolate-y and rich, just not what you’d expect from a mousse. The cannoli was freshly filled with a house made filling and it was amazing. If we’d been at home, I would have just picked it up with my hands and nibbled at it, licking my fingers after I was done. But, we weren’t at home and i was sharing, so we just shattered it with spoons and forks and scooped it like civilized people. The creme brulee was my favorite. I love a good creme brulee and this was silky and rich with a good, crackly sugar crust. Creme brulee may not be an adventurous dessert, but when it’s done well it’s amazing. From start to finish, it was an amazing meal and very enjoyable. It makes me happy that the desserts are as well done as the rest of the dishes, especially since I’m one of those people who needs to end a meal with something sweet. Osetra will offer their Cupid Shooters through the 15th, in case you’d like to skip the V-Day crowds and celebrate the day after. But, all the other dishes are featured on their regular menu, ready for you whenever you’d like. Many thanks to BAM Communications and Osetra for providing us with an amazing dinner and top-notch service. 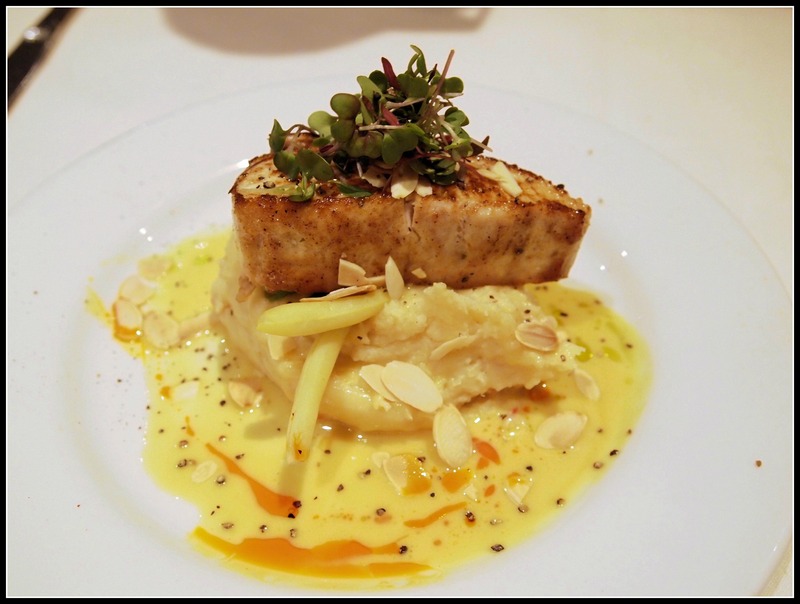 This entry was posted in food, restaurants and tagged fish house, gaslamp, osetra, san diego. Bookmark the permalink. Although I really like oysters, I wouldn’t be able to resist the lobster mashed potatoes. I’ve never heard of incorporating lobster into mashed potatoes, but they could accompany so many things. Everything looks great and fits well for my kind of Valentine’s Day! The lobster mashed potatoes were out of this world! They also do a wasabi mashed potato side with the seared tuna entree, but I can’t imagine anything being better than the lobster mashed.